At the National Portrait Gallery, in London, there is a photograph of two painters by David Dawson. 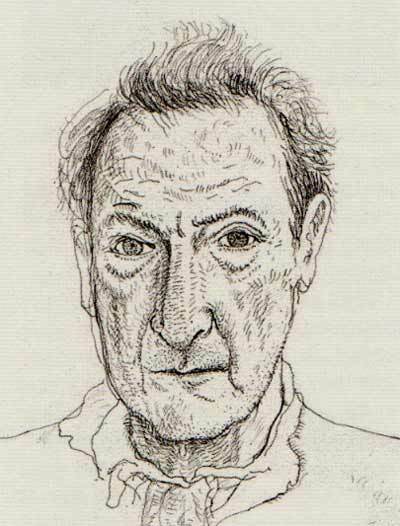 Lucian Freud stands In the doorway of his studio, looking like Dr Jekyll moments after freeing himself from Mr Hyde: white shirt, white apron, scarf knotted about his neck. David Hockney sits beside an easel, surrounded by rags in the paint-flecked studio: chinos, check jacket and blue polo shirt. Both men face the camera. Hockney half-smiles. Freud does not. This is his domain. On the easel is his portrait of Hockney, a bigger than life-size head, rounder and fuller. Not smiling. In spring 2012 London saw new exhibitions by both of these admired artists. Freud, born in 1922, had died only a few months earlier, in July 2011. The National Portrait Gallery’s retrospective spanned his career and had an inescapable valedictory tone. The Hockney exhibition, by contrast, was a huge display of recent work at the Royal Academy – thirteen rooms bursting with big, intensely coloured landscapes, mostly of Yorkshire and some done on an iPad. 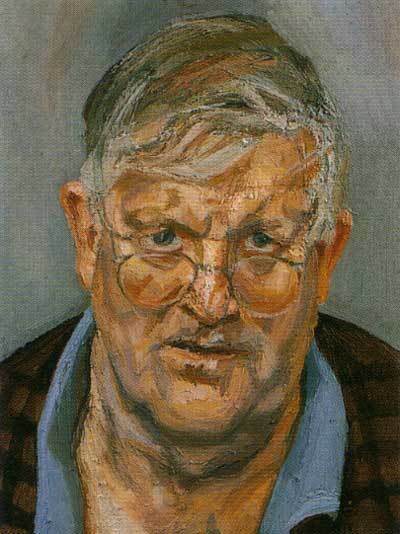 At 75, Hockney gives every indication of exuberant old age – Matisse, perhaps, to Freud’s Rembrandt. Going from one exhibition to the other, the contrasts are obvious. The first, a life’s work; the second, a few years’ only. Here, faces, people and animals; there unpeopled landscapes (with one strange exception, inspired by Claude Lorrain). Here a severely restricted palette; there, vibrant, joyful tones. Where the painters unite – at least in their presentation by these London institutions – is in the power they derive from their art, undiminished as age gathers. Indeed, that power seems the greater by contrast with what we know and expect of old age. Both exhibitions have been hugely popular. Hockney especially has sold so well that the Royal Academy is opening through the evening to allow more people to see the work. There are many reasons for that public appreciation, but one may be the artists’ evident refusal to ‘go gentle into that good night’. Neither rages – that poem was written by a young man – perhaps because they have more interesting, though very different, things still to express.